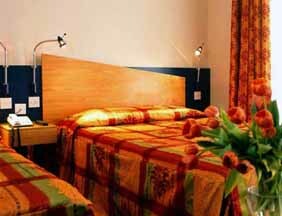 Comfort, value and location in central London are what distinguish the three-star Comfort Inn Victoria hotel. Pleasant rooms equipped with all modern amenities assure a relaxing stay for visitors to England’s vibrant capital city. Situated close to Buckingham Palace, the London Eye, the fashionable streets of Chelsea and all transport links at Victoria station, guests at Comfort Inn Victoria have the heart of London on their doorstep. London Comfort Inn Victoria offers private bathrooms, free Continental breakfast, high-speed internet and satellite TV among its amenities. Comfort Inn Victoria’s helpful and multilingual staff are on hand to assist you with any requirement, be it advice on locating London’s tourist attractions and best places to eat, or to simply organise a wake-up call. Comfort Inn Victoria offers a Business Center with high-speed internet access, data ports and access to fax and copy machines.